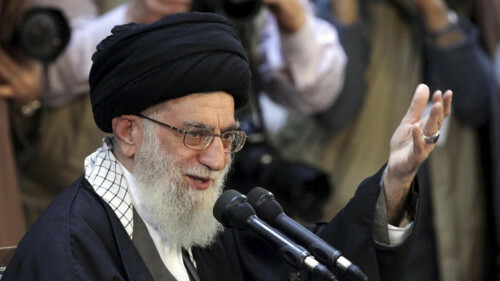 The Supreme Leader has renewed the Iranian regime’s attack on the “hoax” of the US-led campaign in Iraq and Syria against the Islamic State. He added that the enemies of Islam have always sought to drive a wedge between Shias and Sunnis to deflect their attention from the “real enemy” — a possible reference to Israel. On Sunday, the Supreme Leader’s top aide, Ali Akbar Velayati, restated the regime’s condemnation of US intervention in Iraq and Syria against the Islamic State. Velayati said the US-led coalition was “fabricated” and was only established as a front for propaganda. The Supreme Leader and other senior Iranian officials blocked the Rouhani Government’s cooperation with the US after the Islamic State’s offensive took much of western and northern Iraq in June. They have been scathing about the Americans, accusing them of creating the jihadist organization, even after US airstrikes began in Iraq on August 8. Iran’s Police Chief Esmail Ahmadi Moghaddam has shown the regime’s concern over recent deadly attacks on Iranian security forces in the southeast, possibly by the Sunni insurgency Jaish ul-Adl. “Our borders should receive more attention as the threats around us are serious,” Ahmadi Moghaddam told reporters in Tehran on Sunday. Last week, two attacks killed four Iranian border guards in Sistan and Baluchestan Province, where Jaish ul-Adl’s operations have slain dozens of security forces since last summer. On Saturday, senior Iranian police officers en route to investigate the attacks were killed when their plane crashed near the provincial capital Zahedan. See Iran Daily, Oct 12: Did Insurgents Down Police Plane in Southeast, Killing Senior Officers? Fars News, citing an “informed source”, said the plane crashed because of “technical flaws”. The commander of Iran’s Border Guards insisted that there had been no “terrorist attack”. He called for more investment in border control systems. NextIraq & Syria Audio Analysis: Is It Time for US to “Cut and Run” from the Middle East?